ROV Risk Modeler is a comprehensive software suite, that takes the risk analysis modeling, simulation and optimization outside of Excel and into the database environment, to allow the whole process automation and work with very large datasets. ROV Modeler is a customizable advanced analytical modeling software module for solving multiple types of models, including computing advanced models in various industries, advanced forecasting and simulation models, historical back-fitting, time-series forecasts (ARIMA, Autoeconometrics, Regression, stochastic processes, and others), volatility computation (GARCH), and many other applications. 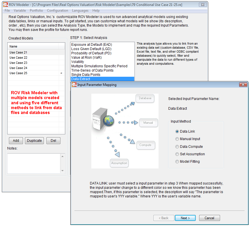 Also included in this module (as well as the Basel II Modeler and Risk Optimizer modules) is the ability to link and download from various databases and data sources (e.g., Oracle OFDM, SQL Server, Excel, CSV, text, and other ODBC compliant databases), screen and clean the data prior to use (applying SQL commands and data cleansing routines), compute new variables based on existing data, run Monte Carlo Risk Simulations, apply data and distributional fitting, and other advanced routines. This module is also customizable in that users can modify the functions list, descriptions, and what models or applications to show, allowing users to customize the tool to fit his or her needs, whereby you can decide which models are important to be shown or used while others can be locked and deleted (i.e., different departments, business units or industry groups may have their own customized modeler). ROV Basel II Modeler is an advanced analytical software module for solving multiple types of models, including computing advanced models in various industries (e.g., for banks, insurance and financial services companies, models such as probability of default, loss given default, exposure at default, Value at Risk, and other key metrics). It also functions like the ROV Modeler as described above. ROV Optimizer has the ability to quickly run project selection and investment or project portfolios using nonlinear optimization with simulation and stochastic optimization, all the while applying discrete integer, binary and continuous variables subject to multiple constraints, as well as an efficient frontier analysis. The optimization can be run on hundreds of decision variables and the results are computed quickly. ROV Risk Valuator has over 600 models and functions to value everything from simple options and exotic options to commodities, futures, and risk-return profiles of asset portfolios, and so forth. Please see the Appendix for a more detailed listing of the models that are available. ROV Charter runs different Modeler and Optimizer profiles and returns predefined XML files that can be used by ROV Dashboard to generate dynamic charts, tables, pivot tables and reports. ROV Dashboard is another software program developed by Real Options Valuation, Inc.
ROV Scheduler runs different Modeler, Optimizer, Charter and Portfolio profiles and returns the results in flat text files that can be saved or easily uploaded into Excel or other databases. ROV Portfolio runs multiple Modeler and Optimizer profiles and multiple models immediately. This is similar to the Scheduler in that multiple models can be chosen to run at once from different profiles, but the difference is that the analyses are run immediately as opposed to being scheduled to run at a later time. This software suite can be run in any Windows or MAC environment (MAC operating systems require Parallels or Virtual Machine to emulate a Windows environment), and is compatible with Microsoft Excel as well as other ODBC compliant databases and data files. The software suite requires 100MB of free disk space and recommended minimum 1GB of RAM for best performance. We recommend that the user has administrative rights (this is by default on most personal computers) but can also run on logins with limited user rights (simply install the software to a non-protected file/folder location in order to properly run the software).